There's a good chance that at some point in your time as a pet owner, your cat or dog will be sprayed by a skunk. The smell can cling to your pet's fur even if the skunk's spray was not a direct hit. By using items found in the home to remove skunk odor from a pet's fur quickly, you can keep your pet smelling sweet. Mix 2 pints of hydrogen peroxide, 1/4 cup of baking soda and 2 tsp of dish soap. The mixture will fizz. This is normal, and is a reaction between the peroxide and baking soda. Wet your pet. If possible, apply this solution before the skunk's spray has dried. Do not let your pet's fur dry between applications. Apply generous amounts of the skunk odor removal solution to the affected area using a sponge. Saturate the fur of the area that was sprayed by the skunk. This solution is safe for cats and dogs, but you must be careful when applying it near the eyes. Allow the homemade skunk odor removal solution to sit for up to 4 minutes. During this time, massage the solution into your pet's fur. Use warm running water to rinse the solution from the pet's fur. Repeat Steps 3 and 4 until the skunk odor has been removed. Sometimes, it's unclear where the pet was sprayed by the skunk. In these cases, run your hands over the pet's body to feel for dampness. If this does not reveal the location where the skunk sprayed the pet, begin by treating the head, face and chest. If necessary, treat the pet's entire body. Wear old clothes and rubber gloves while treating your pet. This kind of treatment can be wet and smelly. Use an outdoor hose, if possible. 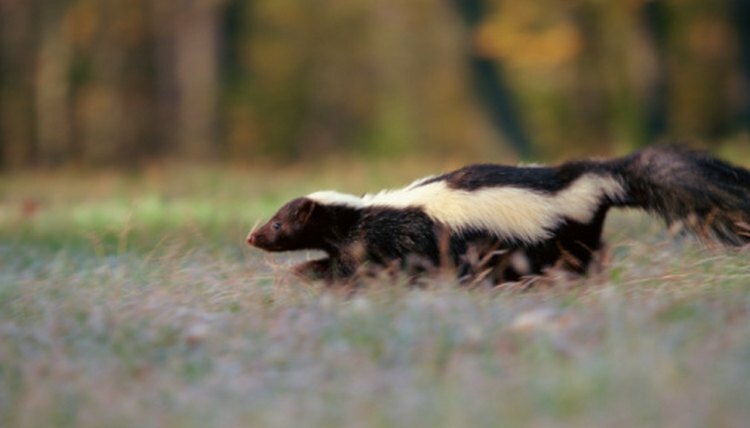 Many pets get sprayed in the eyes when they encounter a skunk. The skunk's spray can be very irritating to the eyes, and needs to be flushed out. Use saline solution to soothe the eyes and flush out the spray. Take your pet to the vet if there are any signs of pain or damage following the run-in with the skunk. Do not store this solution in a sealed container, as it could explode. This solution contains peroxide, which can and will cause slight discoloration to a pet's fur. This is more problematic in pets with a dark coat. Do not bathe your pet with shampoo immediately following this treatment, as the shampoo will lessen the effect of the solution. Dog Breed Info Center: Help! My Dog's Been Skunked!